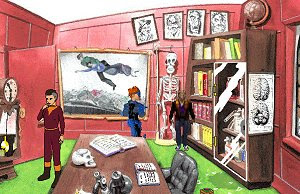 Not long after Thalia James starred in Adventure: The Inside Job, she’s back for an even more surreal freeware PC game in Adventure: All in the Game. Adventure: All in the Game is a great mix of characters taken both from classic and relatively unknown adventures, ranging from Lure of the Temptress to Space Quest and Toonstruck, among many others. Trying to discover the origin of the characters is a game in itself that will keep players busy for some time. There’s also an adjustable option to determine how much of these references are explained to the player. The interface is the standard point and click cursor, intuitive enough for us to explore the very game diverse scenarios. Although it may at times seem like a strange copy-paste of characters from very different origins, things do tend to be smooth and contribute to the overall feeling of past 2D adventure games. Thalia herself couldn’t be more proud.